Eloi Planes of Fluidra, left, and Bruce Brooks of Zodiac. 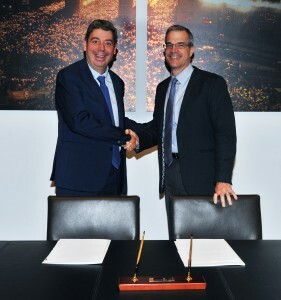 Fluidra S.A., the Spanish listed multinational group serving the residential and commercial pool and wellness sector, and Zodiac Pool Solutions (“Zodiac”), a global manufacturer of residential pool equipment and connected pool solutions, have agreed to merge. The merger is expected to close in the first half of 2018 Fluidra will maintain global headquarters in Sabadell (Barcelona), Spain and North American headquarters in Vista (San Diego), California. Fluidra Executive President Eloi Planes will serve as Executive Chairman of its Board of Directors while Zodiac CEO Bruce Brooks will serve as the company’s CEOThe combined company will keep Fluidra’s name and public listing on the Spanish stock exchange, employ a workforce of 5,500 dedicated pool industry professionals and operate an expansive global footprint stretching across more than 45 countries in North America, Europe, Australia, Asia, South America and Africa, with the US representing its largest market.The merged organisation will offer a significantly expanded product portfolio that includes some of the most widely recognized and respected global pool brands, including Zodiac®, Jandy® Pro Series, Polaris®, AstralPool®, Cepex®, Gre® and CTX Professional®. Additionally, with its expanded resources, the new company will be positioned to accelerate innovation to meet market demand for more efficient, customer-focused solutions in growing fields like robotics and the Internet of Things. Zodiac brings to the merger its strong position in North America and a dedicated focus on residential pool solutions, while Fluidra brings its strength in Europe, Australia, Asia, South America and Africa, plus a product portfolio that includes commercial as well as residential pool products. Combining these complementary geographical strengths and areas of expertise will result in a new organization able to offer innovative solutions on a global basis for the total pool market – from residential to commercial projects. The merger is expected to be completed in the first half of 2018.